One of the UK's last parlour pubs has been bought by two regulars, including its next-door neighbour, after the death of the landlady who ran it for 74 years. After moving to a small Herefordshire village about 17 years ago, Gary Seymour went for a pint in the Sun Inn and felt like he had entered a "time warp". As one of the last remaining 'parlour' pubs, the 200-year-old establishment in Leintwardine does not have a conventional bar or counter and is more like entering an old-fashioned living room - apart from the beer barrels. Mr Seymour said: "It was like stepping back in time. It was a little intimidating." The newcomer found he was the only person in the pub and was not welcomed by the elderly landlady, Florence 'Flossie' Lane. "I was given short shrift by Flossie," he said. "That first time she said the pub was 'not open' - which she often did for different people. "But when I went back next time with other customers, she was fine." That first visit began a long association with the Sun Inn for Mr Seymour, who has just bought the pub with another regular, Nick Davis. 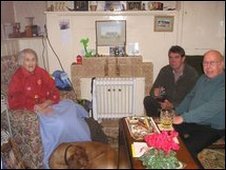 The pair were among villagers who campaigned to save the historic pub after Flossie died in June, shortly before her 95th birthday. Villagers say the Sun Inn is an important part of community life and a meeting place for groups such as the cricket club, firefighters and bell ringers. It also holds social and fundraising events, including music and quiz nights and an annual beer festival. Flossie was born at the pub, which was originally owned by her parents. She took over the licence with her brother Charlie in 1935 and they ran the pub together until he died in 1985. She then ran it single-handedly, and was to become the oldest landlady in Britain, according to the Campaign for Real Ale (Camra). The landlady usually sat in the same seat in the corner and would keep her takings in a row in jars. Flossie never married or had children and, after her death, the inn was inherited by her nieces. 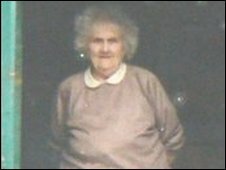 It was expected to be sold at auction in August and villagers, some of whom had kept the pub going following Flossie's death, feared it would be sold to property developers. However, Mr Seymour said Flossie's nieces were keen for it to remain as a traditional parlour pub and so sold it to him and Mr Davis, who owns Hobsons Brewery, for an undisclosed sum. Mr Seymour has run the chip shop, the Fiddler's Elbow, next door to the pub for about eight years and became good friends with Flossie, who he described as very caring and generous. He said: "She was a really strong character. She had quite a sharp tongue and a wit with it and if she didn't like someone she wouldn't hold back. "Although she never really left the pub, she was always interested in people and what was going on." Despite running a pub, Flossie was herself teetotal, preferring a cup of tea to a pint. For the last few years of her life Flossie was increasingly helped by carers, he said. People in the village also rallied round to make her teas and Sunday lunches and often put her to bed too. Before the pub's sale, villagers began a "Save the Sun" campaign, which was backed by Camra. 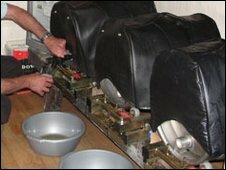 Mark Haslam, of Herefordshire Camra, said that if the pub died "a part of England's soul dies with it". "It's not just important to its community, this place is a national treasure," he said. While Mr Seymour said was keen to "preserve a living museum". "The chairs and benches all look into the centre of the room and it forces people to talk," he said. "It's very welcoming and we get a broad cross-section of people. For example, the other week we had an archbishop, local butcher and farmer here." The new owners intend to make very few changes to the pub's rooms. Mr Seymour said they aimed to promote local beers and ciders and create a new room for community and music events. So the Sun Inn is set to remain at the heart of village life.